The word ‘medieval’ is often used pejoratively, synonymised with ‘the Dark Ages’ to denote a simple, long-ago era of cultural and intellectual backwardness and extreme violence. But what we now call ‘the Middle Ages’ or ‘the medieval period’ lasted for over 1,000 years; from – roughly – the break-up of the Roman Empire in the 5th century, to the birth of Henry VIII at the end of the 15th. And this historical millennium was one of immense creativity and diverse literary output. Despite the ravages of time, numerous medieval chronicles, letters, poems, and prose narratives survive in a variety of now-forgotten languages, preserved in the leaves of hand-made medieval manuscript books held in air-tight conditions in libraries across the world. My session at St Robert in His Time, titled ‘Celebrating Saints in the Middle Ages: Robert of Knaresborough in Medieval Manuscripts’, was about medieval stories – stories about St Robert of Knaresborough (c. 1160-1218). Over the course of the hour, we examined one genre of medieval writing: narratives written to celebrate the holy deeds and miracles of individual saints – texts known as “saints’ lives”, or, more formally, “hagiographies” (from the ancient Greek hágios, meaning ‘holy’, and -graphia, ‘writing’). 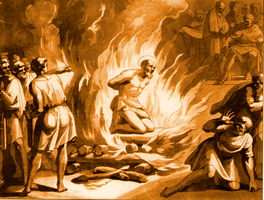 Hagiography was one of the most popular literary genres of the Middle Ages, the earliest ‘lives’ being those of the early Christian martyrs (such as St Polycarp) who were persecuted and killed for their faith during Christianity’s first few centuries. The dead bodies of these defenders of Christ were thought to be imbued with miraculous powers and were carefully guarded and cared for by other Christians. As Christianity became better established, new saints were celebrated by the Christian faithful: holy men and women whose way of living was considered virtuous and devout in the extreme. Among the earliest of these non-martyred saints were ‘the desert fathers’: monks and hermits spent their time there in extreme poverty, starving themselves, harming their own flesh, wearing uncomfortable clothing, and depriving themselves of sleep. Through the practice of this self-inflicted suffering for God, called ‘asceticism’, these early Christians, through their lives of severe simplicity, were thought to have reached a higher spiritual state, having become closer to God in their imitation of Christ’s suffering. One of the most famous of these ascetic saints, was the 4th-century desert father St Anthony of Egypt. When he was just 18, Anthony was in church and heard a reading from the Gospel of Matthew where Jesus says: ‘If you want to be perfect, go, sell what you have and give to the poor, and you will have the treasures of heaven’. Anthony’s wealthy parents died around the time he heard these words, and upon inheriting their money and property he decided to follow Jesus’s advice, selling the family’s lands and donating the money he made to the poor. Anthony then fled society, and started living in the desert, spending whole nights in prayer and fasting. Stories of extreme Christian virtue like Anthony’s remained popular all through the Middle Ages, and the text describing Antony’s life was one of the best-known literary works in the whole of the medieval Christian world. It was continuously retold over the centuries and would have been talked about in churches during Robert’s lifetime. Robert himself, one of his hagiographers reports, was a keen consumer of this ‘literature of sanctity’ (a phrase coined by medieval historian Robert Bartlett). According to one early Latin prose text, while educating his companion Ivo, ‘Robert set before him many examples from (the lives of) the saints’. The same text also states that Robert was fond of visiting churches and monasteries, where tales of saintly asceticism would not have been hard to come by. It certainly seems as though Robert’s own way of life was modelled upon the lifestyles of the early Christian hermits, and, when you spot them, the parallels between the lives of Anthony in the 4th century and Robert 800 years later, are really quite striking. Like Anthony, who left all his worldly possessions and the society he was once part of, Robert left his family in York and went out in search of a life of solitude, so he could devote himself to God. Like Anthony who shut himself up in the side of a mountain, Robert lived in a cave. Like Anthony, Robert ate a diet of bread and water and other simple things, and like Anthony Robert slept on the ground. Just as Anthony fought against demons in his cave, demons who deviously tried to distract him from his prayers, so too did Robert. And, like Anthony and many other saints, Robert had supernatural healing powers; he was so spiritually pure that he was able to channel God’s grace so that it might reach and positively impact others. Although Robert lived almost 800 years after Anthony, the same length of time that separates Robert from us today, key aspects of Robert’s holiness and his way of life as a hermit were inspired by and part of a long tradition of Christian sanctity based around self-deprivation and a rejection of the world as a way to develop spiritually. So, Robert was a consumer of saints’ lives, but he himself was also a subject of hagiographical writing. His holy life of ascetic solitude and care for the poor inspired no fewer than four hagiographers to put pen to parchment to celebrate his sanctity in the years following his death in 1218. Still surviving are two lives of Robert in Latin prose (both composed in the 13th century), one in Middle English rhyming couplets (composed in the late 14th or early 15th century), and one in Latin verse (currently undated). Each of these narratives tell the story of Robert’s life. 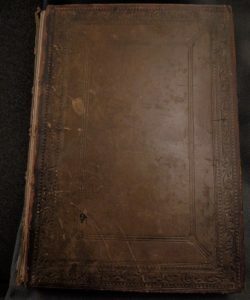 But each was authored by a different person at a different stage in medieval history, and although all the hagiographies share lots of similarities in what they tell us about Robert, they also differ markedly from one another; each is a unique literary creation with its own individual emphases and literary style. For the purposes of my session, we focused on three of these medieval texts: the two Latin prose lives and Middle English poetical life. Selected excerpts from each were provided in translation and distributed to the audience, who were divided into three groups. Together, we discussed how the earliest text detailing Robert’s life portrays Knaresborough, rather inauthentically, as ‘a place of horror and vast solitude’. Audience members pointed out that there was a castle and thriving town at Knaresborough in the Middle Ages, and that this was a rather unusual phrase to pick to describe the area. Reading this early life of Robert alongside some other medieval texts using similar phrases, however, we discussed Tom Licence’s suggestion that this text may have been composed by a member of the Cistercian Order, perhaps from the nearby monastery of Fountains (the Cistercians were founded in France in 1098 but had houses throughout medieval Europe). One of the key aspects of medieval Cistercian monasteries was that they were built far from the madding crowd, away from towns and cities. A narrative detailing the foundation of one of earliest Cistercian houses at Clairvaux, near Dijon in France, for example, describes the monastery being built in ‘a place of horror and vast solitude’ and the same phrase can be found in lots of medieval Cistercian writing. Once we’d recognised the phrase as a ‘Cistercian slogan’, rather than a literal description of Knaresborough, we were able to discuss the possibility that the text was trying to imply a spiritual connection between St Robert and the Cistercian Order, by choosing very specific Cistercian language to portray his sanctity. We then turned to a discussion of the second 13th-century Latin life of Robert, the Life of St Robert by Knaresborough. This text, as Joshua Easterling has emphasised, was critical in successfully establishing Robert as patron saint of Knaresborough Priory, which was run by the Trinitarians. The Order of the Holy Trinity for the Redemption of Captives was founded in 1198, and, like the Cistercians, they started in France and later spread throughout Europe. Their founding purpose was to ransom Christians taken captive in the Holy Land during the crusades, but they were also an Order dedicated to living in poverty and to helping the poor. For the excerpts distributed among the audience, I picked those parts of the narrative that emphasised Robert's devotion to the Trinity, and those parts where the hagiographer referred to him as 'our patron'. We discussed how these aspects of the text implied spiritual connection between Robert and the Trinitarians at Knaresborough. We also talked about how this text sought to distance Robert from the Cistercians, by including an episode in which monks from Fountains Abbey attempted to steal Robert’s holy corpse against the saint’s will. It was, and still is, of course a huge spiritual honour to host the holy remains of a saint. The caretakers of such remains – the saint’s relics – had to make sure the powerful bodies of the saintly dead were treated respectfully and solemnly remembered. It was also the shrine-keeper’s duty to manage the crowds of pilgrims who would come to visit the holy tomb. And on a practical level, a flourishing shrine could also bring income to a church or monastery, money that could be spent in accordance with the institution’s Christian commitments. Cistercian-Trinitarian competition over Robert’s body, legacy, and cult, then, might account for the existence of two similar, but subtly distinct Latin prose versions of Robert’s life from the 13th century. The Fountains monks, the early Trinitarian life tells us, went home empty handed and Robert was buried in his riverside cave-chapel in Knaresborough. Around a century later, however, the Trinitarian Order produced a new text about St Robert, around the late 14th or early 15th centuries. And this time, the text was in English. Written as a poem, in alliterative rhyming couplets, the Middle English life of St Robert is one of many saints’ legends that was translated into the English vernacular in the late medieval period. Using language that casts Robert’s sanctity in heroic, knightly terms, we discussed how this later text flirts with the genre of medieval romance, telling Robert’s life story as if it were a medieval adventure tale about the quest of a chivalrous knight (I discussed the connections between this text and the genre of romance in much more detail at the 2018 Medieval Insular Romance Conference in Cardiff). In the Middle English text, Robert is listed alongside heroes of secular literature, favourably compared with battle-hardened warriors such as ‘Arthur, Hector, and Achilles.’ Instead of rescuing a lady, slaying a monster and living happily ever after, however, Robert helps the poor, defeats the devil, and offers his soul to God so that he might live in eternal bliss by Christ’s side. Robert is still the hermit we all know and love, but through clever use of language and metaphor, the author of the Middle English version of his life makes Robert into a ‘holy hero’: a hero who always chooses the spiritual over the mundane, who reaches his goal of eternal divine bliss after many setbacks and tribulations. This session was about getting to know Robert better. Not just as a medieval saint but also as a powerful figure who inspired medieval men to write about him, a holy man who prompted his devotees to share his life story across space and time. It is important to recognise the work of the medieval hagiographers who recorded and preserved Robert’s sanctity in literary form – without them we wouldn’t know very much at all. Hazel’s research on the cult of St Robert of Knaresborough is funded by the Swiss National Science Foundation as part of a larger project on northern sanctity at the University of Lausanne, titled ‘Region and Nation in Late Medieval Devotion to Northern English Saints.’ This project is led by Professor Denis Renevey with Professor Christiania Whitehead as Senior Researcher. Hazel’s thesis is titled ‘The Cult of St Robert of Knaresborough and the Trinitarian Order in Medieval England’. For more information about Hazel’s thesis, the wider research project, and the research team, please visit: https://wp.unil.ch/regionandnation/. For more of Hazel’s reflections on St Robert in His Time, see the SNSF project blog, here. Easterling, Joshua, ‘A Norbert for England: Holy Trinity and the Invention of Robert of Knaresborough’, Journal of Medieval Monastic Studies, vol. 2, pp. 75-107.